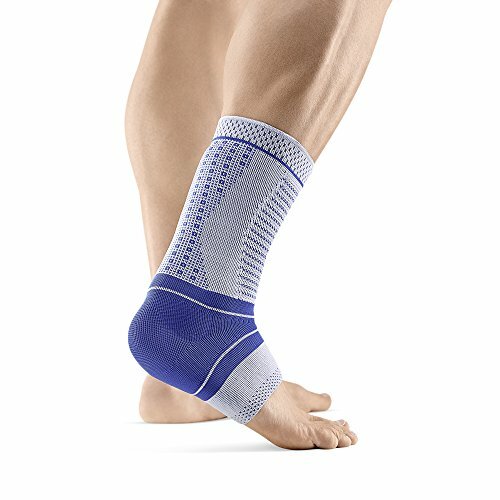 Bauerfeind AchilloTrain Achilles Tendon Support, 93/4 - 103/4 , Titanium Extremely comfortable knitted support with a knobbed viscoelastic insert alongside the Achilles tendon to treat>Achilles tendon injuries. Product Features: Lightweight, breathable anatomical knit will not retain heat and provides an excellent fit that is very comfortable to wear . Viscoelastic insert runs alongside the Achilles tendon leaving thetendon pressure-free and providing intermittent compression which reduces pain and swelling . Viscoelastic insert has soft, proprioceptive stimulating nodules on the inside as well as longitudinal grooves so that the upper tendon and muscle-tendon transition and nerve endings are stimulated by the wing-like insert . With movement, the nodules provide a massage that accelerates the healing process. . Stimulation of the nerve endings in the muscle transitions heightens proprioception and improves muscle control . Integrated stretch zone knitted in the front of the support makes it easy to put on and take off . Promotes proprioception, thus heightening sensory awareness in the ankle for increased joint stabilization . Machine washable . Can be used to treat: Achilles tendonitis . Achilles tendon strain. Bursitis of the Achilles . Post-Achilles tendon rupture . Haglunds Deformity . Seiver’s Disease. Product photo may not exactly match the product offered for sale. Please refer to the product description. The Seller usually ships this product within 1-2 business days. In accordance with their customer-centric policy, this Seller does not charge your credit card until the product has been shipped. If unexpectedly, a product is on back order, the Seller may take longer to ship the product however the Seller in all cases, will inform its customers immediately with a choice to cancel or hold the order until shipped. If you have any questions about this product by Bauerfeind, contact us by completing and submitting the form below. If you are looking for a specif part number, please include it with your message.